General Description of IgA Secretory Component / ECM1. This MAb reacts with a reduction-resistant epitope present in both free, SIgA bound Secretory Component. It does not react with the cell lines lacking secretory component. The antibody is useful for studying the distribution, level of both free, bound secretory component. Secretory component is differentially expressed in epithelium,, the antibody is a popular marker for identifying subpopulations of epithelial cells, epithelial differentiation. The Secretory component antibody is a useful research tool for studying mucosal immunity, inflammation, remodeling, differentiation, tumorigenesis, all processes associated with differential secretory component expression. Anti-ECM1 antibody staining is expected to be primarily localized to the cytosol and nucleoplasm. 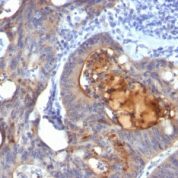 Variations in IgA Secretory Component / ECM1 antibody staining intensity in immunohistochemistry on tissue sections are present across different anatomical locations. An intense signal was observed in glandular cells in the epididymis. 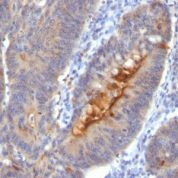 More moderate antibody staining intensity was present in glandular cells in the epididymis. Low, but measureable presence of IgA Secretory Component / ECM1 could be seen inadipocytes in breast, chondrocytes in mesenchymal tissue, follicle cells in the ovary, glandular cells in the adrenal gland, cervix, uterine, seminal vesicle and thyroid gland, neuropil in cerebral cortex, peripheral nerve in mesenchymal tissue and respiratory epithelial cells in the bronchus and nasopharynx. We were unable to detect IgA Secretory Component / ECM1 in other tissues. Disease states, inflammation, and other physiological changes can have a substantial impact on antibody staining patterns. These measurements were all taken in tissues deemed normal or from patients without known disease. 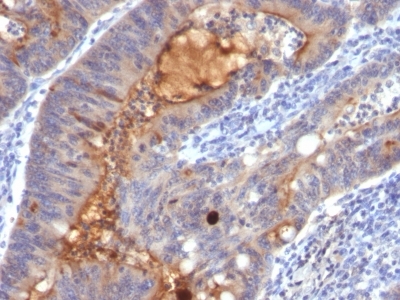 Tissues from cancer patients, for instance, have their own distinct pattern of IgA Secretory Component / ECM1 expression as measured by anti-IgA Secretory Component / ECM1 antibody immunohistochemical staining. The average level of expression by tumor is summarized in the table below. The variability row represents patient to patient variability in IHC staining. enQuire Bio's IgA Secretory Component / ECM1 Anti-Human, Rat Monoclonal is available for Research Use Only. This antibody is guaranteed to work for a period of two years when properly stored.